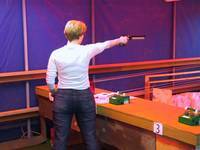 Organized air gun shoots are held at the range on a weekly basis. These shoots are organized by the Victoria Precision Shooting Association (VPSA) but NSRG club members, as well as outside guests are always welcome. VPSA has several club air pistols available for people who do not have their own and will provide advice and coaching if required. The range is suitable for air rifle or air pistol, shot from the standing position, at the standard international targets, from a distance if 10 metres. The range provides space for up to 8 shooters shooting at fixed targets. There are three shooting positions equipped with returning targets and for special events an further five returning targets may be set up. There is, in addition, a moving target machine which may be set up and which accommodates one shooter at a time. The air gun range may be used by NSRG club members on an individual basis 24 hours a day and seven days a week except when occupied by other scheduled events, chiefly Trap shooting by the shotgun section on some Sunday mornings and some Tuesday evenings (see the NSRG Range Schedule Calendar). No competitions for this event have been organized but members frequently shoot on their own or at the weekly air gun meets. Ideally the shooter should have a high quality compressed air rifle equipped with iron sights and special clothing. However any air rifle may be used. The proper targets are available and the event is shot standing. This is held at the indoor heated air gun range at NSRG. This indoor facility also features electric target systems. For more information on air gun shooting contact Willi Teipel at 250-656-2206.